The people, places, and political prominence of Washington, D.C., make it a prime target for attack by enemies of the United States. Major General Robert Smolen ’74 plays a key role in protecting the nation’s capital—and marshalling military forces to help if a crisis develops. Smolen commands the Air Force District of Washington, part of the Joint Force Headquarters-National Capital Region, which brings together the resources of the Air Force, Army, Marine Corps, and Navy so that there’s a single point of contact should responding to a disaster in the area require military assistance. Smolen explains that, during a disaster, states typically call first on their National Guard units and then can request federal help. But dealing with a major catastrophe—such as an attack in a high-profile location—could quickly exceed the capabilities of local and state authorities. So in 2002 the federal government formed the Colorado-based U.S. Northern Command to streamline the process of providing military support during crises in the continental United States. The work of Smolen and others to protect Washington, D.C., is part of that larger national effort. Smolen’s post actually combines two critical jobs into one. 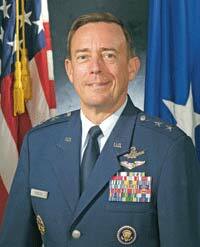 Along with his duties defending the capital region, he oversees the day-to-day operations of two Air Force bases: Bolling Air Force Base, just off the Potomac River in Washington, D.C., and Andrews Air Force Base in Maryland, best known for handling air transportation for the president and other senior officials. No stranger to high-level appointments, Smolen worked for nearly two years in the White House prior to his current assignment. The senior ranking military officer in the complex, he developed and implemented policies to support the president and the National Security Council. Before that he served as director of nuclear and counterproliferation at Air Force headquarters in Washington, D.C.
Smolen didn’t plan on pursuing a military career when he entered the Air Force ROTC program at Allegheny. “It was 1970 and the Vietnam War was going on,” he says. “My draft number came back—and it was 36. I was looking at things practically.” ROTC gave Smolen the opportunity to fulfill his military commitment while receiving a college education. With the help of friends Dan Todd ’74 and Dave Barninger ’74, both now retired from the Air Force, Smolen completed ROTC and graduated from Allegheny. He advanced steadily through the ranks, serving in posts across the country and as a commander at Osun Air Base in South Korea. This article was featured in the Winter/Spring 2007 issue of Allegheny Magazine.